Redesigned 2019 Mercedes-Benz Sprinter van to cost ,985 | Car News, Reviews, & Pricing for New & Used Cars. Mercedes-Benz on Wednesday said that its new, U.S.-built full-size cargo and passenger vans will cost slightly less than the model they replace. The 2019 Mercedes-Benz Sprinter will cost $34,985 to start in cargo van configuration, $5 less than the outgoing model, but its price will climb fast thanks to the myriad options the automaker will offer for its big vans. The automaker opened the new Sprinter assembly plant outside of Charleston, South Carolina, on Wednesday. The Sprinter is offered in 144- and 177-inch wheelbases, in cargo, crew, passenger, and chassis cab configurations. 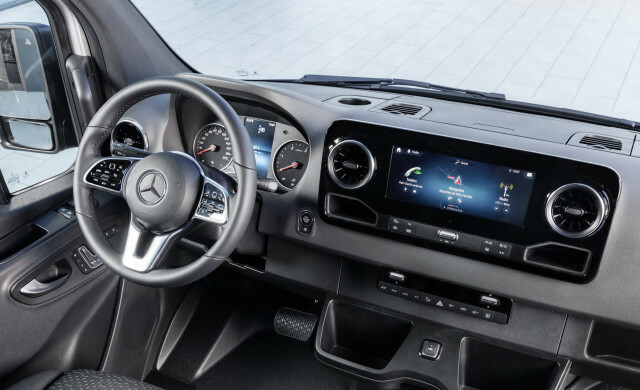 Cargo vans have seating for just a driver and passenger plus a cargo hold as voluminous as some apartments—533 cubic feet in certain configurations, Mercedes says. Passenger vans cost $44,185 to start and can be configured to seat as many as 15 occupants. Crew vans cost $42,485 to start and are a combination of passenger and cargo with two rows of seats and a large cargo area. The $40,985 chassis cab is aimed at upfitters such as the recreational vehicle industry. Those prices include a mandatory $1,195 destination charge. The base Sprinter uses 2.0-liter turbo-4 rated at 190 horsepower and 258 pound-feet of torque to power the rear wheels via a 9-speed automatic transmission. A 3.0-liter turbodiesel V-6 rated at 190 hp and 324 lb-ft is likely to be more popular and can be paired with either rear- or all-wheel drive depending on the configuration. The turbodiesel includes a 7-speed automatic transmission and adds $6,000 to most versions of the Sprinter. All Sprinters include keyless ignition, a pair of USB-C outlets, LED headlights, and six airbags, but the extra-cost optional equipment list is lengthy and includes luxuries such as a 10.3-inch touchscreen for infotainment, adaptive cruise control, blind-spot monitors, automatic emergency braking, and heated and power-adjustable front seats. The van is also sold at the same price by Freightliner commercial truck dealers as the Freightliner Sprinter. Both Mercedes-Benz and Freightliner Sprinters will arrive to dealers by the end of the year. Previous articleVolkswagen cancels all six-cylinder Passat models in the U.S.